When we started this blog in January our goal was to stay connected to each other from across the country and to work toward getting fiercer as we get older – and have fun doing both! We are so excited that you have joined us on the journey and we love your comments, input and the fact that you’re hanging out with us! 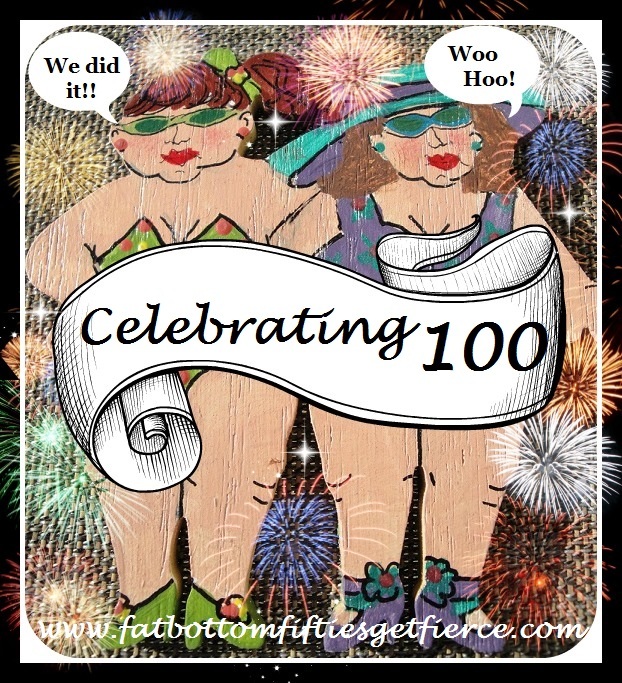 This week we are celebrating hitting our 100th post. 100! The first 99 seemed to just fly by! To start off our celebration, we’re looking at what our top 10 posts have been to date and what our personal favorites were. 10. Think Outside the Basket – Great gift basket ideas – without the baskets! 9. 10 Fun No-Cal and Lo-Cal Ideas for Your Easter Table – Because celebrations and gathering with loved ones doesn’t have to be fattening! The concept was so well received that we tried to make it a monthly feature. So far we have No-Cal/Lo-Cal posts for 4th of July, Memorial Day and a Labor Day Luau with Home Game Night coming up next week. 8. From Grief to the Last Birthday Party – From sadness to celebration over the loss of a loved one. 7. Day Before Friday Easter Humor – Light-hearted silliness! 6. 5 More Good Things About Being Over 50 – 5 more humorous truisms. 5. Friday Five – Have a Chuckle – And a good idea or two! 4. Celebrating National Book Lover’s Day – Our kind of holiday! 3. Friday Five #3 – Another post to send us smiling into the weekend! 1. 7 Things Not to Wear When You’re Over 50 – It’ll make you smile while nodding your head at the same time! 1. Quinbloits – Words You Have to Be Over 50 to Understand – Couple of reasons, 1) El did such a great job both visually and otherwise and 2) I think we will be creating quite a glossary by the time we are done! 2. Don’t Should On Yourself – Always good to keep reminding myself of this. 3. I’ll Take a Generous Helping of Escargot Please – Still love the snail mail. 4. Confessional – Yarn Bombing – Didn’t notice any colorful nests but had a great time playing. 5. Mind Games – Any excuse to play, I’m there! 1. The Battle of the Bra – Because this war is still on! 2. Paraprosdokians – The Voices in my Head May Not Be Real, but They Have Some Good Ideas! – Love the new (to me!) word, loved the concept! 3. Change Your Space – the 365 Day Challenge – As someone trying to break my clutter habit, I loved this idea from our guest blogger. 4. 5 Little White Lies – These still crack me up! 5. (Not) My Little Pony – It was personal for me.